Want to Know More About Olefin fabrics? Read this! Guilo Natta, the chemist who developed the process to make Olefin suitable for textiles. Olefin (polypropylene) fabrics are made of synthetic fibers that are durable and stain resistant. Well… How did Olefin get here? In Italy during the 1950's, chemist Giulio Natta, developed a process that made Olefin suitable for a variety of textile applications. In 1960, the United States began producing the fiber. Today, Olefin makes up 16% of the total fiber production in the US. Predominately, you can find Olefin fibers in upholstery fabric. How are the fibers made? Olefin fibers are derived from ethylene and propylene. Polymerization of propylene and ethylene gases, controlled with special catalysts, create Olefin fibers. Olefin is difficult to dye once it has been formed. Since Olefin fibers are tough to dye after manufacturing, it is solution-dyed. The colors are added into to the polymers before or during melting. The melted polymer is then spun by a spinneret, which looks a little bit like a shower head. The fiber is pulled through tiny holes to form long fibers. There are several benefits of this process. One, is the manufacturing process is less expensive than others. Manufacturing Olefin produces very little by-product; that means less waste, which is good for the environment. Olefin fibers are plastic and 100% recyclable. To learn more about Olefin’s environmental impact, please click here. What's so great about Olefin fabrics? I'm glad you asked. - These fabrics are extremely durable. - Spills and stains are easy to clean. 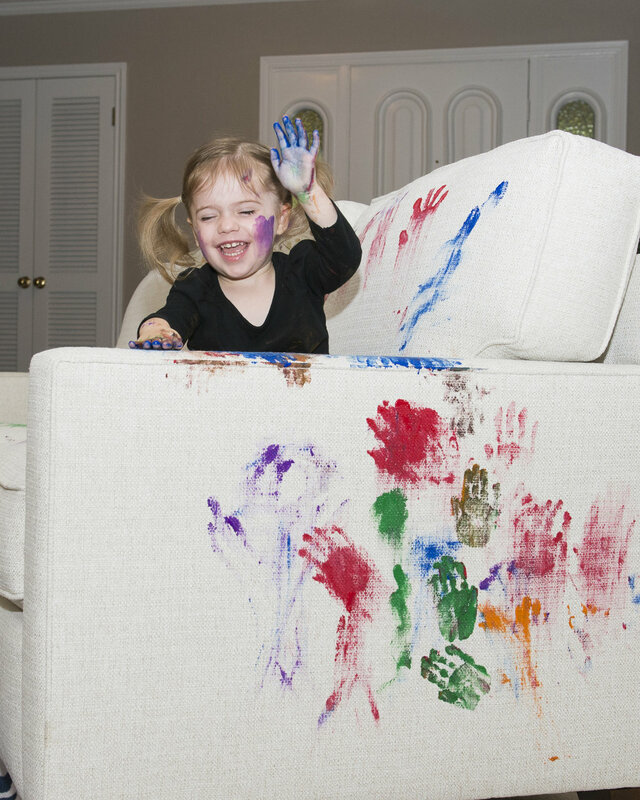 Stain resistance and durability are a huge benefit if you have pets or children in your home. The fabric is even bleach safe for tough stains! - Olefin is resistant to abrasion and mold. It does not absorb water. Waterborne stains are not a problem. It comes in a variety of colors and will not fade. You can find olefin fibers in car and upholstery fabrics, carpets, clothing as well as rope. So there's nothing wrong with Olefin Fabrics? I would love to say “yes”, but nothing is perfect! Oil bonds with Olefin. Oil-based stains are tough to remove. Olefin can break down if extreme heat is applied to the fabric. This would only be a problem if you used a high setting on an iron or a high temperature to dry it. For items that need a fire retardant treatment (FR), Olefin wouldn’t work. Most stains can be easily removed by dabbing the stain with lukewarm water and a mild detergent. You can use bleach on Olefin fabric if necessary. If you wash Olefin, line drying is the best option. If you put the fabric in the dryer use a low heat setting. Ironing the fabric is not recommended. Do not use a brush. Do not dry clean, as many dry-cleaning solvents can harm the fibers. For more detailed cleaning instructions, please visit our cleaning page here.